Jaw couplings are a type of shaft coupling that are used for rotational power transmissions. They are used to transmit torque between two shafts and help protect components from damage by dampening the shock and vibrations. Jaw type couplings feature two aluminum alloy hubs with protruding lugs known as “jaws,” and a polyurethane elastomer insert known as a “spider” that fits in-between the hubs. Polyurethane elastomer spiders offer a higher load capacity than other coupling materials and are designed to provide either a loose or tight fit. The elastomer material also provides good resistance to oils and chemicals, also offering electric isolation between both shafts. Jaw and spider couplings have different torque ratings determined by the hardness (durometer) of the elastomer spider, making them suitable for a wide range of mechanical applications. 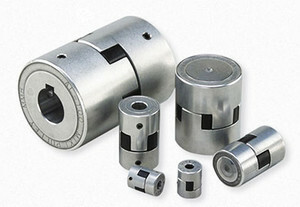 Miki Pulley offers jaw & spider couplings with pilot bore, keyed, or clamp style hubs. There are three different elastomer spider options. Request a quote for your jaw couplings today or contact us for assistance choosing the correct coupling for your performance requirements. The ALS-R model utilizes a 97 JIS A hardness polyurethane elastomer spider, with the spider profile and fit designed with a tight fit to allow no backlash. The ALS-Y model utilizes a 90 JIS A hardness polyurethane elastomer spider, with the spider profile and fit designed to allow no backlash. This coupling may be used in applications from general purpose motor connections, to simple servo applications with high torque. The element is of a lower hardness than the ALS-R, thereby suppressing axial reaction force. The ALS-B model utilizes a 97 JIS A hardness polyurethane elastomer spider, with the spider profile designed for a loose fit. This allows for misalignment while providing high torque transmission. This simple jaw and spider coupling features a nitrile rubber element between two sintered aluminum hubs. Using aluminum in the hubs decreases moment of inertia on starts and stops. AL couplings are available in standard bore sizes with key and setscrew, or pilot bore. Bores may also be machined to customer specifications upon request. 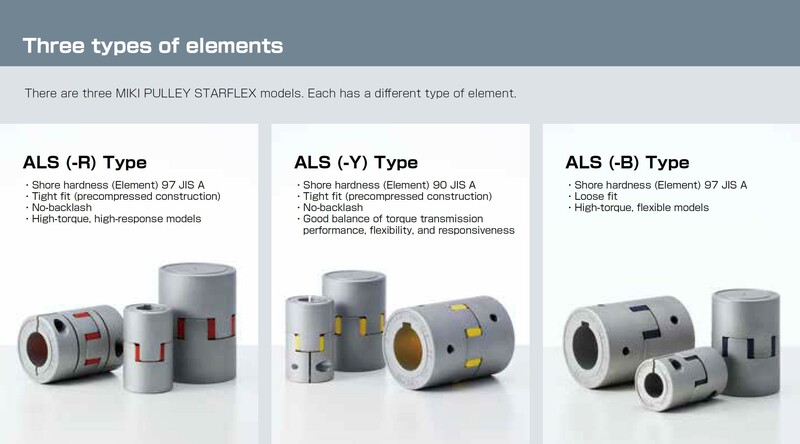 Miki Pulley’s ALS elastomer couplings are a simple jaw & spider shaft coupling with sintered aluminum alloy hubs and polyurethane elastomer spider elements. Customers may choose from with three different spider element options and three hub styles, depending on your performance requirements. Our elastomer jaw couplings may be used in applications from general purpose motor connections, todemanding servo applications with high torque. 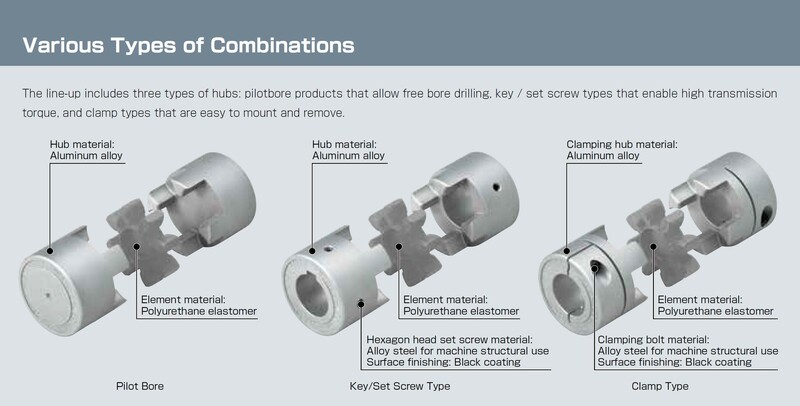 We offer a range of jaw & spider couplings to create coupling combinations that meet the needs of a wide range of applications. The curved profile of the element allows for pre-compression with no backlash and our elastomer spiders are designed to provide a loose or tight fit. ALS (-R) Type: a high torque, high-responsive model that provides a tight fit with a no-backlash design, with little capacity for mis-alignment. ALS (-Y) Type: provides a good balance of torque transmission performance, flexibility and responsiveness and features a tightly fitting, zero-backlash design. ALS (-B) Type: provides a loose fit with a high torque, flexible design, and larger mis-alignment capacity. Pilot Bore: Less costly option, allowing the customer or end user to machine the bore to their specifications. Jaw and spider couplings from Miki Pulley transmit up to 387 ft-lbs. (525 Nm of torque) and are offered with three types of spider elements to provide the jaw coupling fit your application requires. 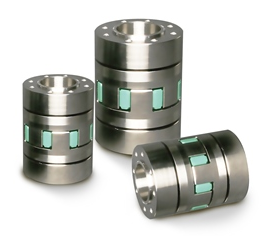 Our fail-safe elastomer couplings are designed for long service life and robust performance. We provide elastomer jaw & spider couplings to meet your application requirements. Request a quote for jaw type couplings or contact us for additional information.